Writing comes from a very personal place and many writers agree that the process is an isolated one. Tapping into our own experiences when composing stories can, at times, take us to some pretty dark places. Cathartic writing is a way to unleash pent up emotions while at the same time creating potential ideas for characters and stories, but how much of ourselves should we put into our writing? Is creating a character much like ourselves a good idea when writing a novel, or does it just lead to awkwardness and self-aggrandizement? Can we remain objective and develop a plot successfully if we are personally connected to the events? Personally, I think all writers should put a little of themselves into their stories. In fact, I’m not sure there is any way around having some of ourselves enter into our writing. Writers have often heard the old advice: “Write what you know.” Cathartic writing, such as journaling or blogging, can often lead to some great ideas, but sometimes those ideas can get lost in the shuffle. Maybe they don’t come across as well as we would like because we are too close to the subject matter to be truly objective. Can exorcising our personal demons morph into a great story, or will it just come off sounding like an overly-exposed therapy session? Who can we turn to for advice on this subject? My answer: Stephen King. Stephen King is one of those writers who explores his dark side resulting in some fantastic storytelling. I highly recommend his book On Writing: A Memoir of the Craft. This book contains a lot of stories about his life and how those life experiences have shaped his writing. He is a man who successfully uses writing to overcome some of the personal demons with which he struggles. This book is a great guide for those writers considering using their cathartic writing to generate their own stories. Well that’s one of the real problems isn’t it? To be good writing has to be honest. To be honest you have to write what you’re really thinking and that makes most people uncomfortable. Hell it flat out terrifies most people. Of course it becomes a paradox with fiction–you’re making everything up (telling lies in other words) but must remain dead honest or the readers B.S. alarm starts ringing. Inspiration seems to flow from pain, discomfort and despair much more than from contentment and happiness. Struggling with and conquering (however temporary) our fears and anxieties through writing is a great accomplishment whether it’s fit for publication or not. First off, for many, many years I have thought that I didn’t have what it takes to write. I could never get a hold on that creative thing in school and thought I lacked imagination. The truth was that I was terrified of letting myself show in my writing and that is what is was lacking all along. Once I stopped being embarrassed about what people thought I me when I wrote (which is just a very recent development for me… recent as in the past year), the words have been flowing like a waterfall from my brain, through my fingertips, and into my posts via my blog, others blogs, & letters to my friends. It has been like free therapy for me, I have found that I greatly enjoy doing it, and my friends & family seem to enjoy it too. The “crazy coincidence” part is that I’m a huge King fan and have all of his books. I read “On Writing” a few years back, before I understood that I could actually write. 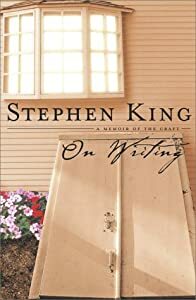 I enjoyed the book for the memoir, and seeing into his mind a bit more, but I didn’t take everything to heart because writing was not an intimate subject to me then. I actually decided a couple of days ago that it was time for me to re-visit the book because I have a whole new respect for writing and would be reading from a different perspective. I started re-reading the book just last night, then I happen across this site this morning and this post is the first thing I see. A strange coincidence indeed. Eric Bahle is absolutely on the money. People can tell in your writing if your not being honest or if you’re holding back your feelings. It’s scary to put yourself out there, in front of the world to be judged, but, if you have confidence and believe in yourself, it is immensely rewarding and liberating. .-= Wendy Coneybeer´s last blog ..Respect is…? =-. On a related note, a couple nights ago I was actually looking back through my blog I started this year and could clearly see the point where I started really writing honestly, facing my own demons. Now that I know the feeling & the result, I hope I don’t ever revert back to the superficial stuff. That is an amazing coincidence, Wendy! Thank you for sharing your insights. We hope you will visit our blog again sometime.